Without intending to, she revealed the truth about Trump. With Omarosa’s departure last week from the White House, we are reminded once again of the truth-telling power of Trump Administration women. It’s not that the women speak truth — Omarosa’s claim that she voluntarily resigned, for example, strains credulity. It’s that they perform (otherwise unspoken) truth: they make it visible, blurting it out through photos and media clips, through fashion choices, and through the highly theatrical roles they all play. Of all these inadvertent oracles, (henceforth just “Omarosa” as befits a pop-culture icon) may be first among equals. In fact, her capacity to telegraph — even predict — truth is likely what got her fired (uh, compelled her to resign). At first blush, Omarosa seems of a piece with many other administration women. Like Ivanka, Hope, and Melania (as well as bench players such as Vanessa Trump, Lara Trump, and Louise Linton), Omarosa is telegenically beautiful and va-va-voomy, favoring a wardrobe of fitted sheaths and pencil skirts paired with sky-high stilettos. Like the others, she wears her hair beauty-pageant style, in loose, shoulder-length waves. This look is longstanding, dating back to her very first job with Trump as a contestant on three seasons of The Apprentice, from which she was fired three times. But Omarosa’s usefulness to The Apprentice franchise extended beyond the sartorial. She was the show’s most effective stock character. One of very few African-American cast members, she was famously portrayed as the trouble-maker, a soap opera villainess. We all know reality-television shows are heavily edited to create drama and character, and Omarosa lent herself with gusto to the role producers created for her. Omarosa continued her television collaboration with the future president beyond The Apprentice, creating a dating series called The Ultimate Merger (a typical Trump notion: love as corporate transaction) in which 12 men, living together in a Trump hotel suite, competed for the affections of one woman. In Season One, that prize was Omarosa. Merger expanded the slightly dangerous character Omarosa had established on The Apprentice, adding more racist subtext. In the first episode, Trump explains that he will help Omarosa find the man “who can tame her,” framing her from the outset as a stereotypical, hyper-sexualized black woman. Omarosa dove right in, donning décolleté dresses for ‘dates’ in hotel suites and bikinis for make-out sessions in hot tubs. The clichéd obviousness of Omarosa’s Apprentice and Merger characters pales, though, before the luridly camp version of herself that appears in the recently unearthed ten-minute film, Soul Sistahs, directed in 2005 by former In Touch Weekly photo director Michael Todd just as The Apprentice was peaking in popularity. It would be hard to find a pop-culture artifact more symptomatically prescient about the Trump administration than Soul Sistahs: A money-mad television mogul presides over a universe of racist and misogynist stereotypes where all ideas seem recycled from old movies and television, dialogue is leaden, and real people (like Omarosa) coexist with fictional characters (like Ruby). This last quality — Soul Sistah’s blending of fictional and real life — is a hallmark of the Trump presidency, which owes its existence to reality shows in which Trump played a bold leader, preparing voters to accept him as such in real life. And here is where Omarosa proved a most potent purveyor of truth: She was the sole reminder of Trump’s former television existence, the only other reality star in the Executive Branch. Like “crossover” characters who travel between television shows (think Matt LeBlanc reprising his Friends role on Joey), Omarosa linked the president’s past — his fictional, on-camera world — to his present. Only Trump’s present is supposed to be non-fiction, not a TV spinoff. Everyone around Trump is required to maintain the illusion of reality — never to acknowledge how much of this administration consists of play-acting (a pretending to be a Middle East peace negotiator, for example). But Omarosa is different: Her very presence reveals the device. In theater terms, she breaks the fourth wall. Like the stage actor who addresses the audience directly, Omarosa shatters the illusion we are watching something “real.” She’s Trump’s longstanding performing partner — and we know that. Omarosa implicitly demotes Trump from president to co-star. And it’s not just Omarosa’s presence that conjured the world of television, it was her behavior. Omarosa retained her TV-diva ways, famously goading the president into anger, sowing staff dissension, and demanding special privileges. Like the president, she has a habit of referring to herself in the third person — often as “Lady O” — as if to remind us that she is a made-up character. 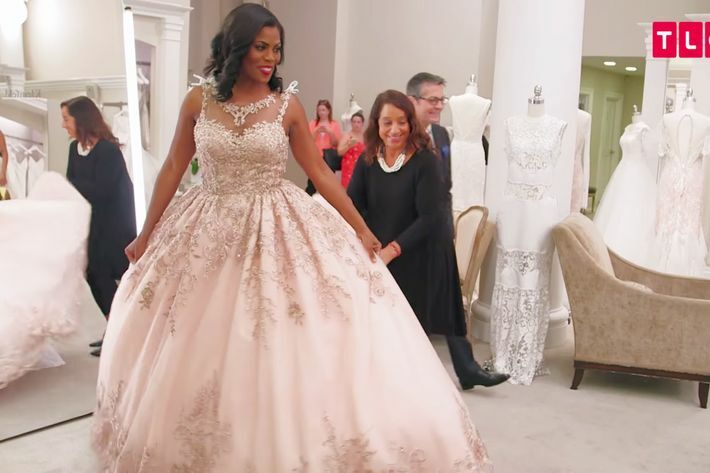 And, incredibly, while working at the White House, Omarosa even appeared on another reality show: Say Yes to the Dress, where she selected a blush pink, bejeweled gown with a crinoline à la Marie Antoinette (claiming she felt “like a princess”). Her wedding itself (a second marriage for her) carried a whiff of Versailles, featuring a gold-frosted cake and taking place at the gaudy Trump International Hotel in D.C. Unsatisfied with these excesses, our heroine trooped her wedding party over to the White House, hoping to use the Rose Garden as a photo backdrop. She was apparently refused, but her intentions remained clear: the White House was just another set. Hired ostensibly to reach out to the African-American community, Omarosa’s responsibilities remained fuzzy at best. An administration serious about this task would surely never have hired Omarosa anyway, given her reputation as a treacherous sellout “persona non grata in the black community,” as Charles Blow . Timing is always worth noting, and Omarosa’s departure coincides with the stunning upset, in the Alabama Senate race, of Trump’s favored candidate — accused child molester and slavery-nostalgist — Roy Moore, to Doug Jones. It was a watershed moment, decided largely by Alabama’s black voters. Speaking truth to power, they sent a loud message of resistance to the White House. The following day, Omarosa was dismissed. In other words, at the very moment when African Americans rose up to call Trump out on the racism he denies, Trump ejected not only his only senior black woman staffer, but the only person who regularly lays bare the administration’s utter artifice — its status as a kind of Truman Show. Perhaps the thinking was that by eliminating Omarosa’s truth-revealing presence, they could piece that shattered fourth wall back together again, close ranks, and resume their presidential (un)reality series unperturbed. Doug Jones’s victory suggests otherwise. Reality is starting to crash through from outside sources and will likely continue to do so — with or without Lady O.